For Lori and Lynda, two of Dr. Bessler's patients, surgery was life-transforming. Lori, a patent law paralegal, remembers the exact date of her first appointment with Dr. Bessler. "It was August 4, 2000," she says. She had been referred to him to treat a painful hiatal hernia. "Plus I looked like I was nine months pregnant," she says. "Dr. Bessler told me he could treat both the hiatal hernia and my big stomach, and described the Roux en Y procedure." Before surgery, she weighed 264 pounds. Eighteen months after surgery, which she had in September, 2000, she is down to 170 and is thrilled that she can buy size 10 clothing. "I have had no stomach pain, no reflux, no heartburn since I woke up from the surgery." Lynda is a dental hygienist who has had a lifelong weight problem. "I've always been heavy – it runs in my family," she says, adding "My weight never hindered me." But when a dental patient complained about Lynda's weight, she became upset. 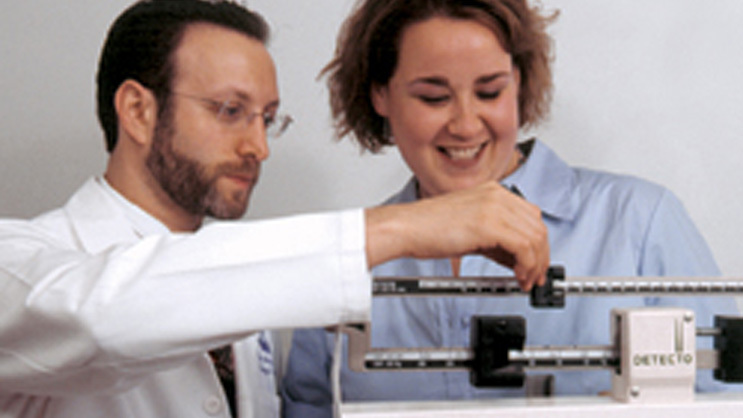 Obesity expert Louis Aronne, MD, a faculty member at Weill Cornell, referred her to Dr. Bessler. "I wanted to schedule surgery immediately after meeting with Dr. Bessler," Lynda says, "but he told me to take the weekend to think about it. I appreciated the fact that he didn't push the surgery on me." Weighing nearly 400 pounds before surgery, she has now lost about 160 pounds, and she is continuing to take weight off. In addition to coming in for their regularly scheduled follow-up visits, Lynda and Lori stay in touch with Dr. Bessler, Lorraine, and Nancy, who answer questions and provide support on an on-call basis. Lynda speaks openly about her surgery with friends and family. She will have an occasional glass of red wine or cocktail (alcohol can slow weight loss), and she fell into old eating habits around the Christmas holidays last year. "I called Nancy, it helped me ride out a few bad days." She is able to travel more - "airplane seats aren't uncomfortable any more," she says, and she is excited about the strengthened muscles she has developed in her kickboxing/karate classes. Lori is more circumspect about her surgery, and she is more rigorous than Lynda about sticking to the recommended post-surgery diet. "My side business is making chocolates – I'll mold anything – but I was told that I cannot have sugar post-surgery. I haven't touched chocolate since the surgery. It doesn't even tempt me!" She walks around midtown Manhattan, where she works, on her lunch hour, and uses a treadmill in bad weather. "Socializing is not a problem," she adds. "My favorite meal is pizza, and I have it once a week. I couldn't get up and down stairs before. Now I run up and down the subway steps. It's great."